In order for our region - and our registration - to be successful, it is important that you follow our three steps for registration. Instructions below. We went through effort to make the instructions and to keep them simple. Please go through the effort to read them. If they are not clear, you can email management@aysosoccer.org with questions, and we can try to make them more clear. Step 1: Complete the Volunteer Survey (required). 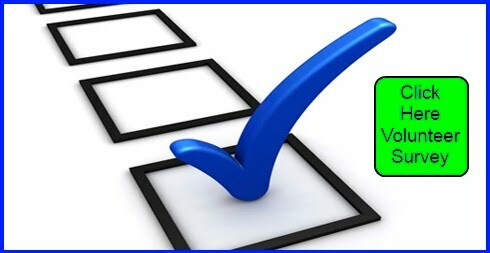 Important - Registration includes a required Volunteer Survey. This includes families of children playing in Extra. Your child will not be registered without this survey being completed. AYSO is a great organization, and it is run by volunteers. Over 200,000 volunteers donate time nationally to make AYSO successful. We need parents like you to help out. It can be found at the link below, and takes only a minute or two to complete. *Please take the time to consider what YOU can do to help our organization succeed... Don't just rush through the survey with every answer of No. Tip - A player can get community service hours for school for refereeing. We train and certify! Log in to eAYSO at www.eayso.org. If you have used eAYSO before, you have an eAYSO account. If this is your first time, The first screen will help you to create your account. If you have troubles with eAYSO, there is dedicated help desk at 866-588-2976, they are very helpful. From eAYSO's home screen, choose Application for a new/returning player. If they played in eAYSO before, they are a returning player. Go through each screen of the player application. This will start with Choosing a Region, and is not complete until you click on 'SUBMIT' at the bottom of the last page. Here are some useful tips for a few of those screens. Player Information - Provide a Family E-mail address. This is how we will contact you. eSign form - This screen is not for printing! This form is where you type your name. This is your eSignature. Online Payment screen - You have choices to pay by Credit, pay by Check, or Print. See Next Step. You can access your Player Registration by clicking [Print] either from the Online Payment screen or from the home screen. Need to print - only one copy per player. Click the printer icon by the red arrow. Repeat application process for additional players. Step 3: Submit your Registration Packet. Volunteer Survey MUST BE COMPLETED online. Print and include a copy of your confirmation email. Player Registration Form printed from eAYSO. Click on [Print player form] from the home screen to print. Only one copy per player needed. Check or money order should be payble to AYSO R213 for the full amount as specified in Fees. Make sure player's name and team is written on the check. Proof of age (birth certificate or passport scanned) emailed to Registrar if needed. Check the DOBV box on the lower right of the Registration Form. If it doesn't say [Y], you need to provide the proof of age. Work with your coach on getting the registration packet to him or her. Once the steps above are complete, our registration team processes your player(s), and will send you a confirmation email requiring one last step by you. This will involve you logging into eAYSO to verify the registration. If you paid by check, you should have paid the whole fee. If you paid by credit card, this is where you can pay the balance. The standard fee for the Fall Uppers program is $160 per player.